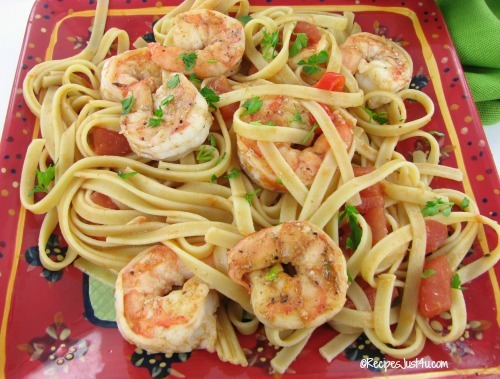 This spicy shrimp and tomato pasta is my latest addition to my collection of shrimp recipes. It will tempt even the most ardent Italian foodie. It is full of flavor, but very easy to make, even though it tastes like you spent hours making it. Spicy Shrimp and Tomato Pasta is a hit. Do you love 30 minute meals as much as I do? Be sure to add this one to your collection! If you are looking for a dish that is ready in less than 30 minutes, this one will be perfect. Everything is basically done while the pasta is cooking and then just tossed together in the skillet and served. The spicy shrimp and tomato pasta has a bit of heat from the red pepper flakes, but not too much. My husband likes spicy food and I prefer it a bit milder but the heat didn’t bother me at all. I enjoyed it very much. I served this with a tossed salad and a side of fresh herbed garlic bread. It is so good! Your family will ask for it again and again. 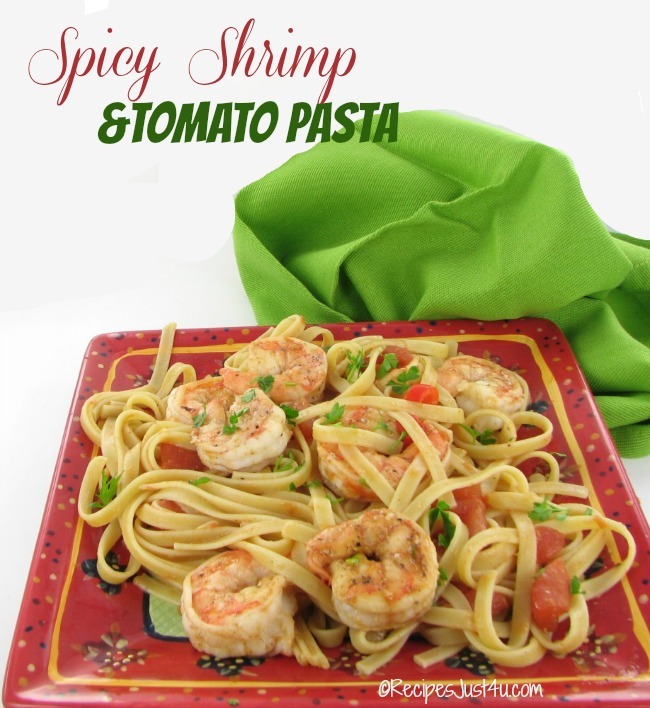 This spicy shrimp and tomato pasta will tempt even the most ardent Italian foodie. It is full of flavor, but very easy to make. Cook your pasta according to package direction, then drain. While the pasta is cooking, add the olive oil and butter to a large frying pan over medium heat. Add the shrimp, red pepper, and minced garlic to the pan and saute for 3-5 minutes, or just until the shrimp turns opaque and slightly pink. Remove the shrimp from the skillet and set it aside. Add the can of tomatoes with juices to the skillet, along with the crushed red pepper flakes, salt, and some freshly cracked black pepper. Stir well, and simmer over medium heat for about 5 minutes. When the sauce has thickened slightly, add the cooked and drained pasta. Toss to coat in the sauce. Add the cooked shrimp back into the frying pan and mix with the pasta. Season if needed. Sprinkle the chopped parsley over top before serving. Great served with a side salad and fresh herbed garlic bread.